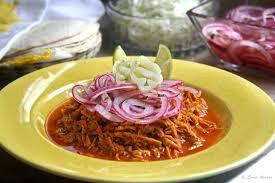 Cochinita pibil is a traditional Mexican slow-roasted pork dish from the Yucatán Península of Mayan origin. In a bowl, put the pork with the oranges juices. In the blender put the axiote paste, 1/2 cup of vinegar, 1/2 cup of water, 2 garlics, 1/4 onion. Blend well and add the mix into the pork. Leave the meat overnight. Then cook for 30 min on high temperature in the pressure cooker. Shred after that.